You can’t force inspiration. And food inspiration is hard to come by when you’re trying to get trim for the summer. Honestly, is there anything less inspiring than some sort of grilled protein and veggies? Sure, if you ate that three times a day, you might be skinny like a Victoria’s Secret model (all of whom seem to hang out at our local gym) – but would you be happy? (Ok, just humour us.) Happiness is catching up with your girlfriends over some nachos and cocktails. Or presenting a colleague with her favourite cake on her birthday. Or eating Sunday aloo parathas made with your mother’s own hands. And it’s even better when inspiration strikes in the form of failed recipes. It took us three tries on a warm Wednesday night to create a seemingly simple sponge for a colleague’s birthday. For whatever reason, the first two cakes failed causing us no end of angst. 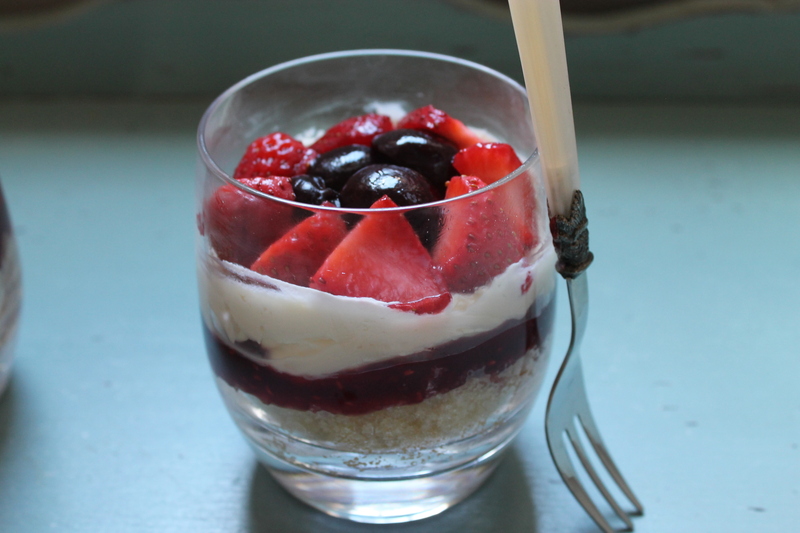 But in the morning, with the sun shining and our positivity back, we realised failure is just an opportunity to begin again (thanks Henry Ford), also an opportunity to make trifle! YUM. 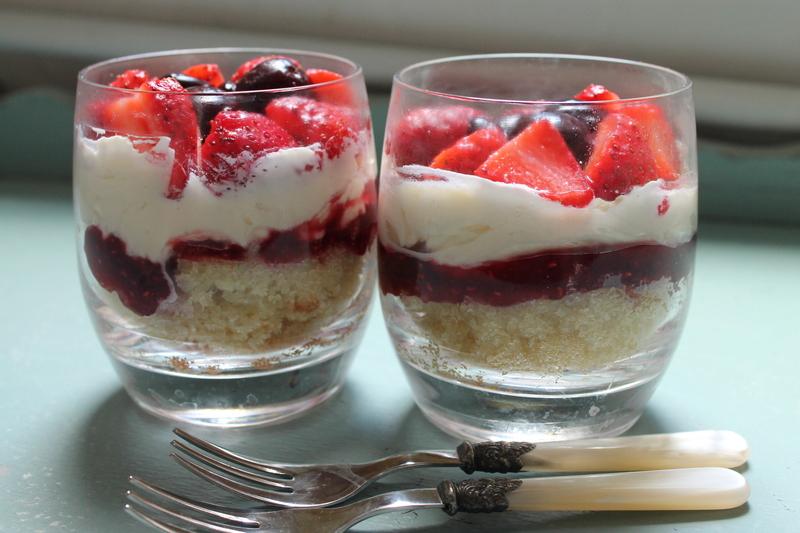 Divide the cake pieces into two glasses or bowls. Dollop an equal amount of jam on top of the sponge cake in each glass or bowl. Whip the cream with the almond essence into soft peaks. Dollop an equal amount of cream on top of the sponge cake in each glass or bowl. 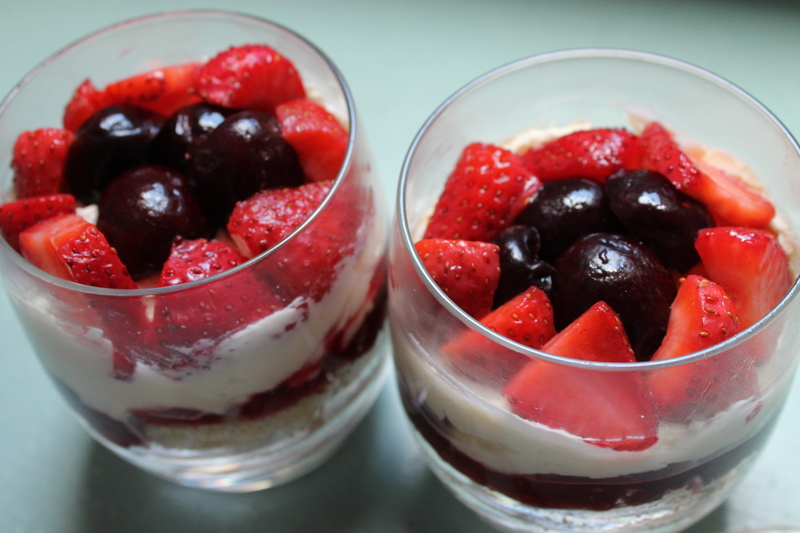 Arrange the cherries and strawberries on top of the cream in each glass or bowl.